Every year, the University of South Carolina meets with the students of the Series Development & Practice design course and introduce the newest novel for the First Year Reading Experience. 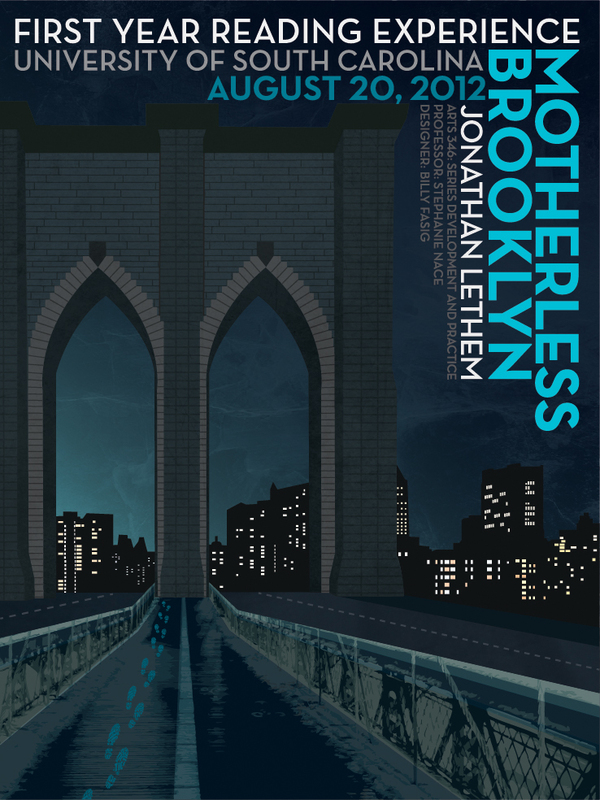 For the 2012 year, we were introduced to "Motherless Brooklyn," a novel by Jonathan Lethem. For the First Year Reading Experience, incoming Freshman at the University are asked to read the book during the summer and then it is discussed in groups during the opening orientation. For the project, we were asked to read the novel, create an idea for a poster, execute it, and present them to a committee. The committee then chose which poster they wanted to represent the event. Mine was in the top three selections. The only requirements for this design was the information that is found on the poster. The creative design was up to us. (and you go with them, astonished to leave yourself behind)"
Lionel struggles with his tics throughout the novel. This chapter suggests that there should be some kind of acceptance of these tics rather than a complete removal of them. The line reads, "you go with them" (them being the tics). In the novel, Lionel says that he wouldn't use drugs to get rid of his tics. He accepts them as part of who he is. I wanted to illustrate this through the footprints on the bridge. Each footprint is created by placing the word "tic" multiple times throughout the shape of the footprint. I wanted this to symbolize the fact that no matter where Lionel goes, the tics go with him and he's okay with that, because they are a part of who he is.